Thanksgiving is on the way! I was going to post this later in the month... but if you're like me, you'll need time to plan ahead. So, I'll start posting holiday recipes now in case you find one you'd like to try. I'm so excited for the holidays! 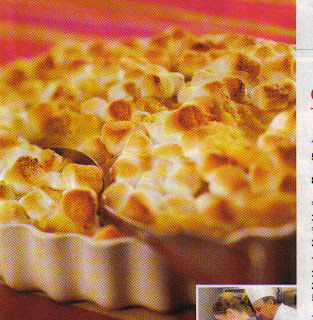 Preheat oven to 350 degrees F. Grease one or more baking dishes (recipe fills to top a deep 9"x13" dish) and reserve. In a large bowl, mix together mashed sweet potatoes, melted butter, milk, granulated sugar, vanilla extract and eggs. Spread sweet potatoes in baking dish. To make the topping: In a small bowl, mix together brown sugar and marshmallows. Sprinkle mixture on top of sweet potatoes. Drizzle melted butter over marshmallow topping. Bake until sweet potatoes are heated through and topping is puffy and browned. *My Note: I've always made these with fresh, mashed sweet potatoes - not canned. Probably good with canned as well. I just wanted to remind you to allow time for peeling, dicing, boiling and mashing the fresh sweet potatoes if that's what you use. Holidays are hectic enough without starting a dish too late. I hope these make your holiday just a little more special!